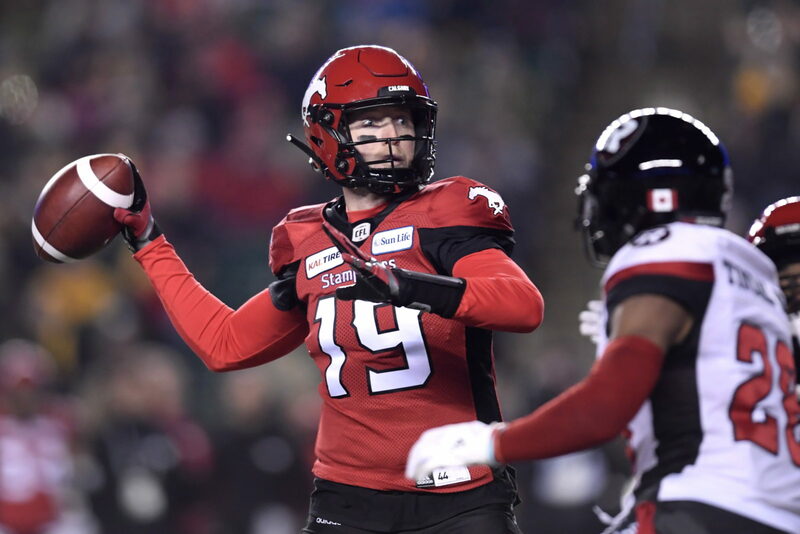 The Denver Broncos are leaving no stone unturned and could be among the favorites to sign CFL star quarterback Bo Levi Mitchell. The Denver Broncos are one of three teams who could reportedly be finalists to sign Canadian Football League star quarterback Bo Levi Mitchell, who worked out for the team back in December when they were auditioning for reserve/futures contract players. According to a recent report from CFL insider Justin Dunk, NFL teams are waiting on Mitchell who is contemplating his options, which include going back to the CFL. This is a quarterback who has achieved the pinnacle of success in the CFL and needs a new challenge. If playing in the NFL is the ultimate goal, I would be shocked if he didn’t pick between one of those situations and the Broncos’ situation is about as good as you will find. The Jacksonville situation could be a good one for someone looking to play right away as well. Mitchell led the CFL this past season with 35 touchdown passes and threw for over 5,000 yards without any individual 1,000-yard receiver. He spread the ball around en route to a championship and is certainly a beloved player up North. How would Mitchell adjust going from being one of the superstars of his league to a player fighting for a roster spot or backup spot in the NFL? You’d have to imagine the CFL would always be a fallback option for him, but if Mitchell has the chops he should get himself into an NFL camp right away. Teams are signing players to reserve/futures contracts right now, which means those players will not count against their 90-man roster until the new league year in March. That could be the source of Mitchell’s hesitance right now. He doesn’t necessarily have to take any deal that’s currently on the table because it’s not like he can go get to work right away anyway, though I’m sure whatever team he signs with will get him a playbook as soon as possible. There would be an interesting fit in Denver because the Broncos have just two quarterbacks under contract — Case Keenum and Garrett Grayson. Grayson signed a reserve/futures deal with Denver, but the Broncos could bring in both Mitchell and possibly still re-sign Kevin Hogan and still look at someone in the 2019 NFL Draft as well. The Jaguars brought in John DeFilippo as their new offensive coordinator, and are considered the favorites for Eagles quarterback Nick Foles. The Vikings have an established starter in Kirk Cousins and former Broncos preseason star Kyle Sloter behind him. Trevor Siemian is an unrestricted free agent. It seems like Mitchell would have just about as good of a shot playing in Denver as he would Jacksonville, and slim to no shot playing in Minnesota, though being the closest to Canada geographically, he may have a big following with the Vikings. This situation is very interesting to follow because it’s rare we have a player this productive in Canada getting a strong look from the NFL. The Broncos plucked Garrett Grayson away from the Alliance of American Football, a league starting up this year. They may not be done taking quarterbacks from other leagues. Hopefully he gets a chance to prove himself in that League. I believe he deserves it. There are NFL Contracts & there are NFL Futures contracts. The Date is March 11 this year. Every NFL team is stocking up on as many futures contracts for a potential 90 man NFL training camp roster. Once the NFL March 11 when the NFL league season officially starts. Once March 11 hits look for alot of players being added & realeased from those futeres contracts and alot of movement. BLM is gona wait it out as long as he can as he is a pro football QB in Demand in the NFL & CFL. BLM will be get a signing Bonus wen he does sign with an NFL team Between March 11 & through as far as june. As long as Bo signs anywhere but Calgary. I’m good with that. Call me sadistic but I want to see what Calgary can do after losing many of their top players like many other teams do. It’s time to watch Calgary rebuild from meritocracy. I dont think anyone will need to worry about Seeing BLM in Calgary for a few years. He has at least a few millions to make first.